Described by the Herald Tribune as “charismatic, brilliant, energetic”, Anu Tali is one of the most intriguing conductors on the international scene today, belonging to a new generation of artists who are constantly searching for fresh musical ideas. In August 2013, Tali became Music Director of the Sarasota Orchestra in Florida. Alongside her duties in Sarasota, highlights of the current season include her debuts with Pacific Symphony and at the Fringe Festival in Philadelphia. She continues in her role as Chief Conductor of the Nordic Symphony Orchestra, which she founded in 1997 together with her twin sister Kadri Tali in order to develop cultural contacts between Estonia and Finland and to unite musicians from around the world. Today the Nordic Symphony Orchestra has members from fifteen countries, featuring musicians from some of the world’s leading orchestras. Tali appears regularly with orchestras worldwide including the Japan and Tokyo Philharmonic orchestras, Orchestre National de France, Chamber Orchestra of Europe, New Jersey, Vancouver, Houston, Milwaukee, Gothenburg and Swedish Radio symphony orchestras. In Germany, she worked with Deutsches Symphonieorchester Berlin, Symphonieorchester des Bayerischen Rundfunks, Berliner Konzerthausorchester, Deutsche Kammerphilharmonie Bremen and Ensemble Modern. 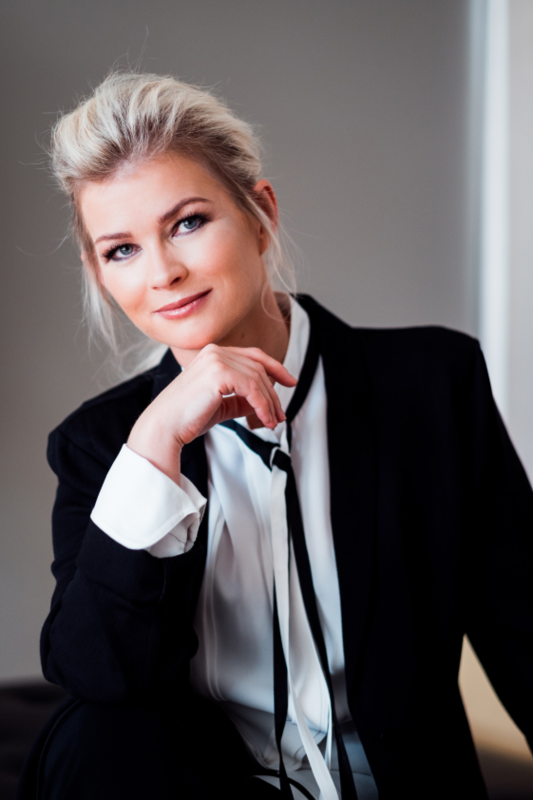 Following a major success with a production of Carmen at Magdeburg State Opera, she was invited to conduct the Freiburger Barockorchester in a production of Gluck’s Telemaco at the Schwetzingen Festival and Theater Basel. She also recently conducted acclaimed semi-staged performances of Goebbels’ Songs of Wars I Have Seen with ensembles including the London Sinfonietta at New York’s Lincoln Center, London’s Southbank Centre and in Saint Paul, Minnesota, Seattle and Barcelona. Tali’s debut recording, Swan Flight, (Finlandia/Warner Classics) earned her the 2003 ECHO Klassik ‘Young Artist of the Year’ Award. Other recordings include Action Passion Illusion for Warner Classics featuring works by Rachmaninov, Sibelius and Erkki-Sven Tüür. Her most recent CD, featuring Tüür’s Strata and Noēsis, was released on ECM in January 2011 and met with significant critical acclaim. Born in Estonia, Anu Tali began her musical career as a pianist, graduating at the Tallinn Conservatory in 1991. She then trained as a conductor at the Estonian Academy of Music with Kuno Areng, Toomas Kapten and Roman Matsow. From 1998 to 2000 she studied at the St Petersburg State Conservatory with Ilya Musin and later with Leonid Kortchmar and Jorma Panula.